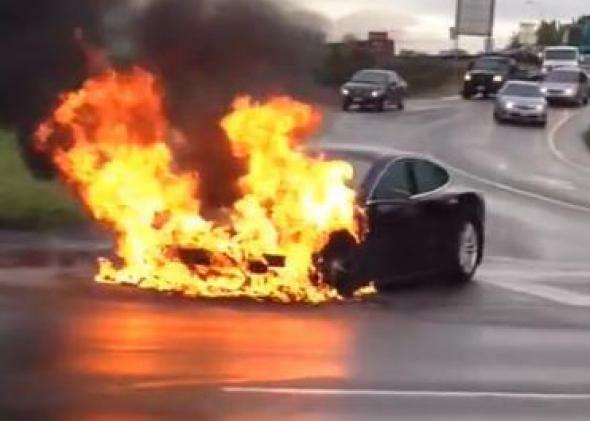 Tesla fire video: NHTSA can't investigate Model S battery fire due to shutdown. A Tesla Model S’ battery burns by the side of a freeway in a Seattle suburb. A man was driving down a freeway in suburban Seattle when he spotted a car on fire by the side of the road. So he decided to shoot a little video. As he rolled past the wreck, he realized with a start that the car with flames shooting from its hood was a Tesla Model S. He posted it on YouTube, and it was an instant sensation, garnering more than 300,000 views in less than two days despite suffering from vertical-video syndrome (see below). Meanwhile, Tesla’s stock has slid significantly. Why is a flaming Tesla such big news? Because battery fires have dented the safety reputation of electric cars in the past, including in 2011 when three Chevy Volts caught fire after crash-testing. As the Associated Press explains, the National Highway Traffic Safety Administration ultimately determined that the Volt was no more risky than gas-powered cars, but it took quite a while for the public’s perception of the car to recover. The Model S, meanwhile, has aced just about every safety test it has undergone. But it remains under intense scrutiny as adoring fans proclaim it the greatest car ever made and critics harbor skepticism and sometimes outright hostility toward the concept of the electric car. Officials confirmed to the AP that the Model S fire started in the car’s battery pack, which they said made it unusually difficult to put out. Firefighters ended up using a circular saw to cut a hole that would allow them to pour water directly on the battery. The blaze doesn’t appear to have been spontaneous: The driver told troopers he believed he hit some metal debris, after which he pulled over and then smelled the burning. A Tesla spokeswoman said the culprit was a large metal object hitting the battery pack. She pointed out that the fire was contained to a small section at the front of the car, which she credited to careful design and construction. Normally, in a case like this, the public could get some clarity via an NHTSA investigation. But, the AP reports, the NHTSA’s field investigations have been suspended due to the government shutdown.